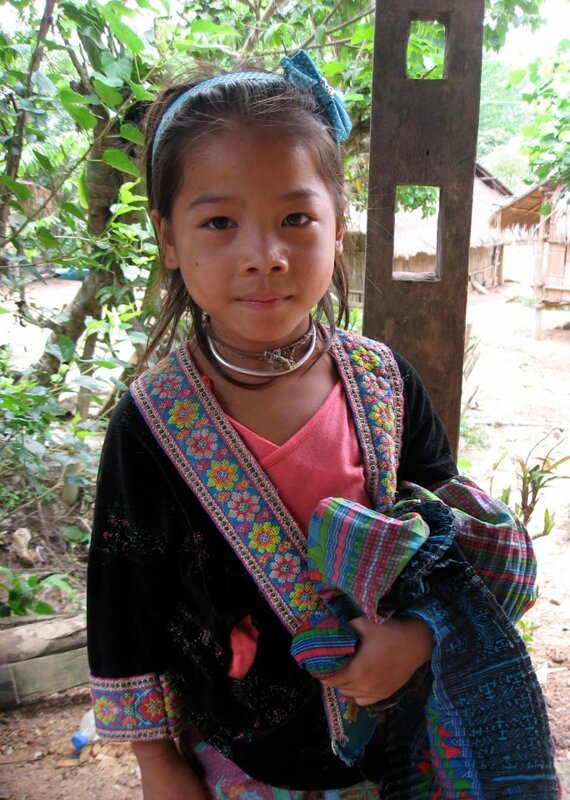 In July of 2010, Don Kraft and I went to visit the Hmong village in Ban Houy nor Khoom that the Windhorse Foundation supports along the Mekong River. We brought suitcases of clothing, shoes, glasses, school supplies, flip flops, antibacterial and medicated ointments, vitamins, soaps, shampoos, conditioners and lotions. After speaking with the village chief about their needs, a woman holding her son on her hip tapped me on the shoulder and showed me her son’s foot. The foot looked awful! It was black and peeling. I grabbed some of the medicated ointment and put it on the little boy’s foot. I gave the tube to the mother, and had our translator ask her to continue putting it on her son’s foot. Soon after we left the village and headed to Luang Prabang. We stayed overnight at the Lotus Villa Hotel. However, I did not sleep well, because I was worried about the little boy. I was afraid that he might have gangrene and without medical help he would loose his foot or his life. I told Andrew the owner of the hotel about the boy. He said he would be glad to follow up. We told him Windhorse would pay all expenses. He asked for the guide’s phone number and the directions to the village. A few days after we left I received an email from Andrew letting me know that our guide had picked up the boy and his father. They took him to doctor and he was diagnosed with a staph araeus infection and put on an antibiotic. The boy was then hospitalized for three days where they treated his foot and then released him to go home. Andrew bought the boy socks and shoes and had the guide take them back home. I was relieved to know that the little boy and his foot would be fine. Founded by educators and professionals from the San Francisco Bay Area, Windhorse Foundation is an all volunteer organization. 100% of donations to Windhorse Foundation support in-country projects jointly planned with local village leaders. Board members and other Foundation support is purely volunteer based. In addition, Windhorse Foundation is not affiliated with any religious or political entity or institution. We rely solely on the generous donations from others to complete projects such as land purchase, organic farming and fisheries, food support, sponsoring children’s education, and other projects.